October 1 and another sunny autumn day begins. We’re having the most beautiful weather. 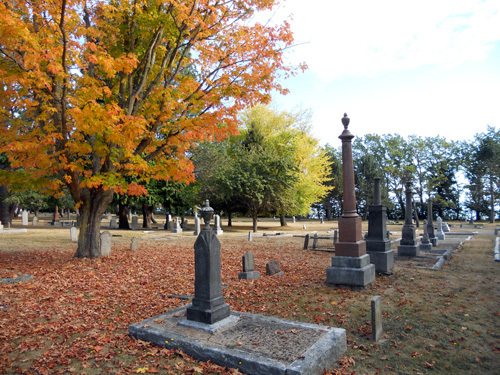 Yesterday we went to Ross Bay Cemetery for a guided walking tour. The Old Cemeteries Society hosts tours every Sunday, usually at Ross Bay, but sometimes at other historic graveyards like Pioneer Square downtown. Yesterday’s tour coincided with the 150th Anniversary of the Incorporation of the City of Victoria Symposium. Several actors in period dress portrayed people of importance from 1862 who are buried at Ross Bay. The Society uses the funds it raises from memberships and tours for materials to upkeep the historic graveyards. This year, we were told, they were able to repaint all the wrought iron at the Ross Bay Cemetery. Their volunteers also do research, gravesite cataloguing and tombstone cleaning. Ross Bay Cemetery, Victoria BC; a beautiful and peaceful place.